Air leakage occurs when outside air enters and conditioned air leaves your house uncontrollably through cracks and openings. This leakage wastes energy and increases utility costs. In California, 30% of energy used in the home is for heating and cooling. 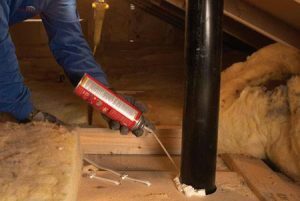 Adding insulation and filling gaps in the attic with caulk, & spray foam are some of the quickest and most cost-effective ways to reduce wasteful air leakage. 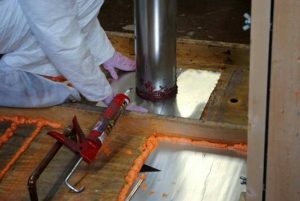 Studies conducted by the Dept of Energy prove air sealing provides the quickest return on investment, usually paying for itself within the first year. Unwanted air drafts make your home less comfortable. Sealing reduces leaks and drafts where treated air can escape from your home, making your air conditioner or furnace work even harder. 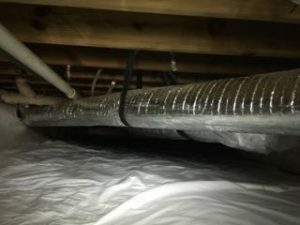 Proper sealing also prevents the hot air which builds up in the attic in the summer from pressing in through your air permeable insulation, into the living area through gaps, cracks and seams in the attic. Proper ventilation is important, but Sealing creates a controlled barrier between inside and outside air. 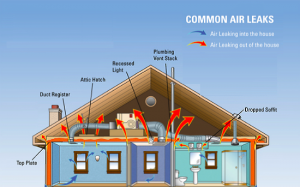 The Department of Energy, through their department “Home Performance by Energy Star,” sanctions air sealing as a crucial component of proper weatherization. They even went so far as to commission a document called “Air Sealing; A Guide for Contractors to share with Homeowners.” Click HERE to download an abridged, version of their published guide. HVAC ducts are a part of the envelope and, like the attic plane, must be properly sealed and insulated for proper weatherization. According to EnergyStar.gov a duct system that is well-designed and properly sealed can make your home more comfortable, energy efficient, and safer. Sealing ducts will help in common comfort problems such as: rooms that are too hot in the summer and too cold in the winter for example. The CA Energy Commission recently conducted a study on the building energy efficiency standards and concluded that Title 24 requirements, which ensure energy efficient standards in construction, be modified to require R-8 insulation for air ducts. Most ducts are only insulated to R-4, if that. Proper weatherization often requires replacing air ducts to ensure proper R-value. 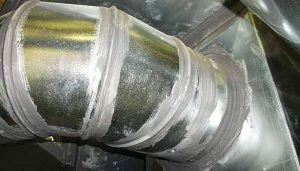 In the alternative, the existing duct system can be sealed with duct mastic to at least prevent air leakage.